You can Save Money By Making Your Own Hummus!! Hummus is probably one of the easiest things you can make yourself. It takes only minutes to make. Why is there soybean oil in hummus? Traditionally, it’s made with olive oil….and you certainly would not use natural flavors if you made it in your own kitchen. According to Wikipedia, Sabra is partly own by Pepsi. You know the soda people? They spent a lot of money lobbying against GMO labeling. If you didn’t know, my mother in law is Turkish and this is her hummus recipe. It is really good! I have not tried freezing it, but I am sure you probably could. For more videos, you can subscribe to my You Tube Channel. Process the chickpeas in the food processor or blender to get them started. Then add all the remaining ingredients until everything is smooth and well mixed. If it is too thick, just add a bit of water until you get the consistency you desire. That is it. Sometimes I drizzle a bit of oil over the top. Enjoy! I loved this hummus but i will do less garlic the next time, too spicy for the 3 year old... a little too much for me as well and I LOVE garlic! Sorry it was too garlicky. I love it that way. Hi Melissa, Tahini is just ground sesame seeds? Do i have to toast the sesame seeds? I have never made tahini myself, but I imagine it's just blended sesame seeds. Not sure if you need to toast them. 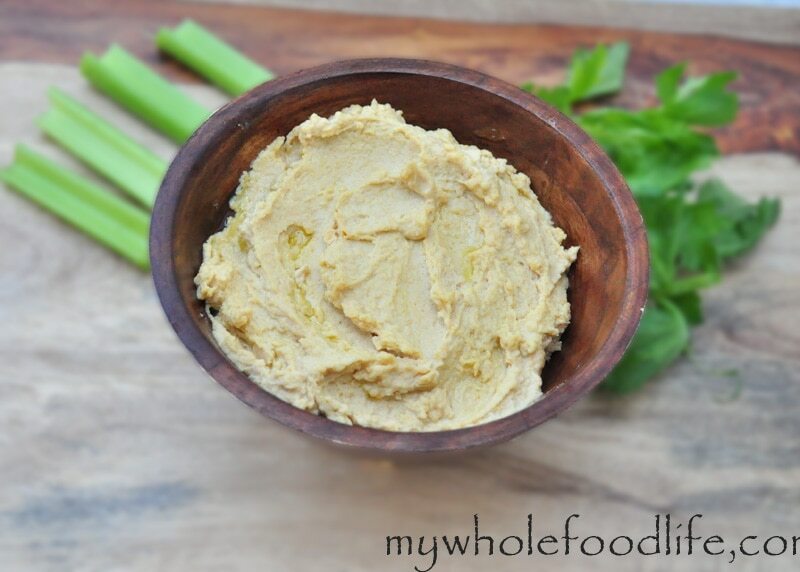 I absolutely love making my own hummus! It is sooo easy. Well, I have to admit I use my Vitamix and I love it. I read somewhere ( I wish I could give credit I just don't remember where I saw it) that you could freeze it. I tried it and it works fabulously! You can make a bunch, divide into useable size portions, and freeze. The only thing you do is smooth out the surface of the hummus and place a thin layer of olive oil on the top to cover the surface and keep it from getting freezer burn. When you pull it out and thaw it the oil has soaked in and does not affect the flavor, consistency or texture at all! When I'm ready for a new container, I take a new one out of the freeze the day before and let it thaw in the fridge overnight. Ta da! I use the Vitamix recipe which calls for raw sesame seeds rather than tahini. It's a great basic recipe(uses garlic and cumin) that you can switch up with whatever spices/flavors you want to create. Enjoy! I make big batches of hummus all the time & also freeze them. But I don't use olive oil in my hummus. When I freeze the hummus, I place a layer of plastic cling wrap snugly over the top of the hummus to prevent freezer burn then seal the container with its cover. Thaws beautifully & tastes just as fresh as it did when I first whipped up the batch. I thawed a batch out of the freezer to share with a friend & she thought it tasted so fresh! I don't always use the oil either. I have frozen it as well. Love making my own. Sun dried tomato hummus is my favorite! @Luisa, try cashew butter or if you can't have nuts, try pumpkin seed butter (I found it in a specialty store). Can tahini be frozen? My grocery store carries only a large jar and recipes call for so little. I was wondering if it could be measured out in Tbls and frozen? Similar to freezing tomato paste? I bet you could freeze it. Maybe in ice cube trays? Any tips on making red pepper hummus? I would add about 1/2 cup roasted red peppers to this. My only disappointment with this recipe is that I didn't discover it sooner in my life. I have recently fallen in love with hummus. Thank you. You can, but you may need to add some other kind of acidic ingredient if it tastes like it's missing something.